“Buddhist,” she calls back, ducking into her white rental car. I found a variant, “What you cling to, you ultimately lose” in a Christian book, The Abingdon Preaching Annual: 1995 Edition, which was published in 1994. “This is what we mean as we turn aside from our daily round to give at Christmas-time. We are meaning then, with all our hearts, the wonderful paradox of human existence, that what we cling to, we lose; and what we give, we have; and when we die, we live. In Buddhist thinking this idea of non-clinging doesn’t just apply to material possessions — we’re so materialistic that that’s the first thing we think of — but to everything, including the idea of having a self. Epictetus said, in regard to a stolen lamp, “A man can only lose what he has.” Perhaps he meant “A man can only lose what he clings to.” It makes sense. As I said above, if there’s no sense of ownership then there can be no sense of loss. This certainly seems very Buddhist, as much Stoic writing does. 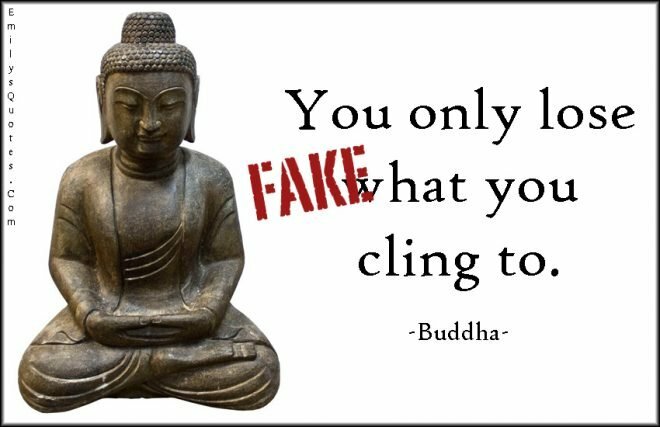 In Luke 17:33, in the New Living Translation version, we have “If you cling to your life, you will lose it, and if you let your life go, you will save it.” That’s remarkably Buddhist in tone. I’ve just discovered this site as I’m trying to find a legit quote to go with a piece I’m writing on letting go. This is GREAT! I appreciate how you provide alternatives and keep a list of ‘actual’ Buddha quotes – in as far as we can say given nothing was written down until 500 years after his death. So if I cling to suffering I will lose it? Doesn’t sound very Buddhist. Clinging in all forms must be abandoned. With the quick reading of this, to me you seem like a stuck in the mind, egotistical, scholarly charlatan. His words were not written down for centuries, no one can say now what he said or did not say in his lifetime. Even today’s newspapers written today with all our tech contain mountains of inaccuracies. You absolutely don’t know what he said or didn’t. Admit it. All we have to go on are the Buddhist scriptures, which (as you say) weren’t written down for a long time. They were also at times subject to manipulation, interpretation, misinterpretation, corruption, etc. And at best they were probably like half-decent lecture notes that captured he main points of what he was saying but missed a lot of the subtlety. There’s no guarantee that anything in the scriptures exactly as he said it. However, they’re the only basis of claiming what he did (or might have) said. So it’s possible to identify things the Buddha never said. If someone were to tell you that the Buddha said “Ich bin ein Berliner” you’d be rightly skeptical — I hope — since that’s a quote that not only contains anachronistic language but which can be tied to another historical figure. So for the main part, what I do on this site is to identify quotes that could not have been said by the Buddha or can’t legitimately be attributed to him because they’re not in the Buddhist scriptures. I hope your day improves, Warren. No, it was my friend Bubba who said, “I lost my gun in the bayou I should have clung to it harder.” You guys mess everything up. Of course, the root of all suffering is desire. What else could it possibly be?